40% of all food produced worldwide, and nearly half of all food produced in the US goes to waste. In the Global North, however, the vast majority of food is wasted not in the field, but in the process of getting to our homes. Whether it is lost to minor imperfections that don’t affect taste, to shape differences that mean that industrial processing equipment that shaves down the carrot to make those “baby” carrots can’t handle them, to losses in shipping, on display at your local market, and finally, rotting in the back of the fridge. As food prices rise and hunger rises world wide, as the population grows and food prices are increasingly tied to the rapidly rising price of oil, reducing food waste becomes absolutely critical to making sure everyone gets fed. In a recent post, I focused on parts of plants in your garden that you may not realize can be eaten and enjoyed. Again, thinking about how to maximize access to food, let’s talk about how to make the most of the food you have by using food preservation to minimize waste – that way you save money and don’t have to buy as much, moreover, you reduce marketplace competition for food and waste – like so many of the things we do, this is a win-win thing. You get yummy food, lower bills, less guilt, less slime in the fridge and less time in the stores – how often do you get so much good stuff out of something so simple? Moreover, western food waste has a particular quality to us – we pack as many calories of fossil energy as we can into the food we throw in the trash to make methane at our landfills. The WAY we waste food – that is, later in the food chain, after lots of processing and preserving makes a huge difference. Supermarkets throwing out lightly dinged cans and crates of produce, households buying food and burying it in the back of their refrigerators – this is the picture of food waste in the Global North. It is worth noticing that specifically speaking, larger quantities of wealth and technology make absolutely no difference in total food wastage – the difference is that we run energy hungry refrigerators and process food into cans *before* we throw it out – investing 20 times more energy in our food before we put it in the trash. Talk about resources down the drain. The average American wastes nearly 800 dollars in food per year – that’s a lot of money down the drain as well. We must change this! Ok, so what can we do to reduce food waste from the time that food enters our hot little hands either from the garden, the market or the store? There are some obvious tools to reduce world food waste, and some not-so-obvious tools. Some of the obvious ones involve making better use of the food you do have, making more meals out of your leftovers, using food scraps for compost and to raise livestock in populated areas (converting waste into fertility and more food), building networks to distribute perfectly good food, encouraging freegans and dumpster divers, and simply doing more sharing – if you can’t eat that CSA share, instead of letting it rot, give it away! One of the less obvious available strategies for us in the Global North, however, is small scale home food preservation. As more and more of us look locally for food, we have more power to reduce both food waste, and the energy used in the food system before we waste. Buying in bulk, preserving what is abundant and cheap at the market, in our garden or in excess in the wild (many invasive plants are delicious), and using methods of food preservation to reduce home food waste can make a significant difference in the overall picture. Just as your pasta molding in the fridge is a link to a much vaster cultural problem, the fruit leather from overripe fruit about to go moldy is a link in the chain that begins to address this fundamental problem. How do you use food preservation to reduce waste? Well, in an emergency – which might be a power outage when everything in your freezer is vulnerable or a hard frost you weren’t prepared for that threatens the tomato crop, you can get out your solar dehydrator, your canning jars, your salt, the root cellar, and protect that food from loss. With a CSA share or a relationship with local farmers, you can get access to cheap food – not industrial cheap food, but the food they have that is so abundant that there are discounts for bulk purchase – and put that food by. Doing so saves you money on higher priced food come winter, but also reduces farmer losses. A particularly good time to do this is around frost – most farmers and gardeners will harvest everything they can right before the frost, leaving them with large quantities of bulk produce available to customers who know to ask. Gleanings programs that glean agricultural fields for food missed by tractors and harvesters can reduce hunger in your community and also give you free food to preserve. So can wild harvest of edibles that grow in abundance or in excess – no need for that garlic mustard to rot into compost, you might as well eat it first. Your farmer or supermarket may be willing to sell you “seconds” – fruit with minor imperfections. But most of all, at the home scale, food preservation can reduce the loss of food in our refrigerators and root cellars. Apples got a brown spot? Don’t dump them, make applesauce or apple leather. Cabbage dried on the outside? Give the chickens or rabbits the outer leaves and make sauerkraut with the inner ones. Do you have a little bit of extra oatmeal? Make crackers. Many of us have a mental image that food preservation is something one does in vast stretches of time, canning a truckload of tomatoes, or a bushel of peaches – and perhaps you’ll want to do some of that too. But really, the simplest forms of preservation involve putting a little bit of what you’ve got a lot of up for your own enjoyment later. Freeze that bit of leftover chicken, and add it to your tacos later. Yes, it is worth making broth with the bones from the chicken wings you had from dinner for your risotto or a pot of soup. When your basil goes to seed, you needn’t pull it – cut the flower heads off and use them to flavor basil vinegar. Frost going to take your squash? Dry that green pumpkin to make green pumpkin pie later, like the Ingalls family did on the prarie, or treat your green squash like zucchini. Pickled watermelon rind is delicious, squash seeds should be dried and spiced for eating. Small amounts of cooked meats can be dehydrated for jerky, or frozen. Cooked leftover grains make wonderful crackers, can be added to breads. Fruit past its prime makes wonderful fruit butters and fruit leathers. Apple pulp from making sauce or apple butter can be used to make vinegar. Dried apple peels mixed with cinnamon and cloves make a delicious tea. Every animal bone in the house gets cooked for stock here – and there’s nothing like real stock. The water vegetables are steamed in makes a nice soup base as well. Ultimately, getting in the habit of cruising through the fridge or the root cellar and looking “what do we need to eat or use soon?” What could I preserve? It takes a certain amount of getting used to the idea that food preservation isn’t just about the glut, but a small part of a daily system, but the rewards are profound. All shopping centers, regardless of their size, have something in common… a parking lot. This is where you or your family is at greatest risk at the shopping center. Think about this… in a parking lot, everyone is a stranger. A violent criminal can easily fit in with everyone else, unnoticed, and appear as ordinary as anyone else. A criminal predator could walk right past you and you wouldn’t know the difference because it is a ‘public setting’. Try this out the next time you go somewhere and park in a parking lot. Sit there for a few minutes and watch how easy it would be for a criminal to attack someone. As people walk back and forth from the store / mall / shopping center and their vehicles, notice how they are usually completely consumed by their thoughts, their cell phones, looking down as they walk, thinking about where or what they are going to do next. When they get to their car, only then will they reach for their keys, turn their backs on anyone nearby while they load the car, their kids, while thinking nothing of the ‘stranger’ nearby. Statistically, crimes will occur right then at that point. Typically this will be purse snatching and robbery. The most important thing to remember in this situation is AWARENESS. Be alert to others in the parking lot. Look for any suspicious looking behavior (you’ll know it when you see it). During the day, park your car away from the hustle and bustle. At night, park under a light, as close to the entrance as possible. Do not park next to a van, shrubbery, or the edge of the building. Observe for a moment before you get out. Don’t get out of the car if it doesn’t seem to be safe. When returning to the vehicle, LOOK AROUND. Have your keys in hand BEFORE you get to the car. If you notice suspicious loitering around or near your vehicle, walk past and/or return to the store / shopping center. Don’t electronically unlock your car until you are fairly close to it. While still at a distance while approaching your vehicle, glance underneath it. When you reach your vehicle, look inside before getting in. You Are Late To Prepping, Where To Start? You have recently decided that it’s in your best interest to become better prepared for disruption of your present way-of-life. The uncertainties in the geopolitical climate, the evident state of the ‘real’ economy, the gut feeling that you have… all combine together and are sending up a red flag of warning that it may be a good idea to take a look at your dependencies and take some immediate action to alleviate whatever pain may come your way as a result in the future. You feel the urgency to do something about it and you realize that you can’t do everything, because you’re late to the party, so to speak. So, where do you begin, and what should you do first? I would say that the best thing to do is that which brings the most benefit for the least amount of work and/or time spent. 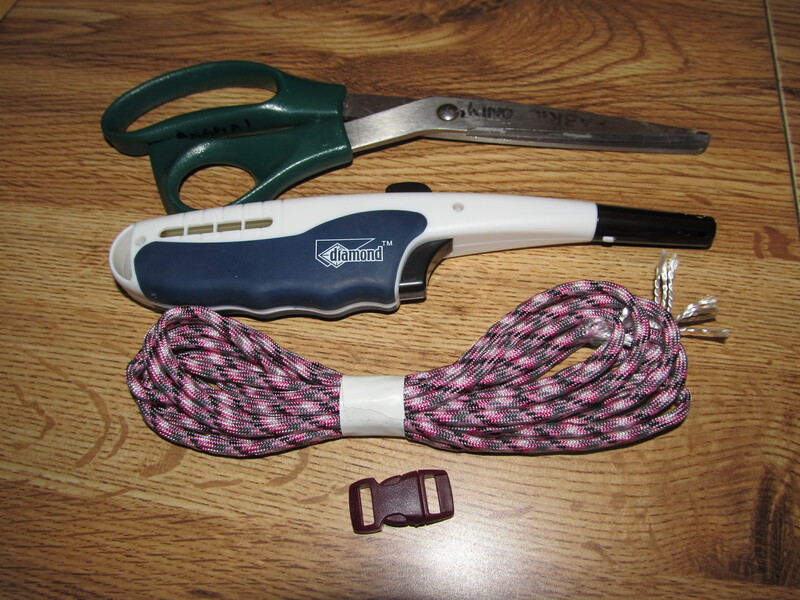 You want to jump start your preparedness. Naturally, the more money you are willing to throw at it, the more you can buy in the short term. Having said that, and before the seasoned preppers jump all over what I just said, buying things is one thing, but implementing a life style of more self-sufficiency is quite another (and takes practice and time). In any event, that said, you will want to build up a quantity of practical foods and supplies. And don’t overlook your water supply situation. Foods. Except for the part about learning to procure your own for the long term (learning successful gardening, etc. ), obtaining a supply of ready-made food is only a matter of deciding to do so and opening your wallet. You could look at any of our relevant advertisers on this site who offer a wide variety of food supply options or you could go out and begin buying your own at the grocery store. There are advantages to buying professionally packaged quantities of food especially made for long term storage, so don’t dismiss this out of hand. Personally, I believe in having a combination of ‘professionally packaged’ foods from a reputable supplier, a quantity of your own hand-picked foods from the grocery store, and a quantity of other food staples like rice, beans, wheat, sugar, salt, spices, etc. (all packaged appropriately for storage). Although this discussion is about a quick short-term solution, again, as mentioned a moment ago, do not dismiss the idea of learning to grow and preserve your own food. If you are new to all this, don’t procrastinate. Go with your instinct and start NOW. After having a look at your food situation, now what about other supplies? For starters, keep it basic. Speaking of the power being out, do you have a means to keep yourself warm (if during the winter)? There are various indoor-safe portable heaters that may be a life saver should you ever need it. Have a portable battery operated radio to stay informed. Knowing what’s going on is as important as the ‘stuff’ that you have. It will enable better decision making. Flashlights (LED type is the best for battery life longevity), batteries (rechargeable), solar powered battery charger, a means to cook without electricity, are all good things to start with. Think of it this way. You need to eat, drink, cook, stay informed, be sheltered, be safe. Think of the categories and then come up with what are the most important things first. Then, go out and get them. The key is, you have to start. really, really wish Blogger would deal with whatever "maintenance"
Sometimes when prepping comes up, a "me, me, me" attitude comes up. about two thousand years ago, exactly the opposite. sharing food and such with my neighbours. I really can't win, can I? watch out for each other's health and safety. We’ve all done it. We hear about some disaster that’s coming down the pipe, or a potential weather event just over the horizon, or maybe the neighbor told us that the Cthulhu is on his way, and that’s what the Mayan Apocalypse is all about. And so we freak out. Maybe a little, maybe alot, but we freak out. 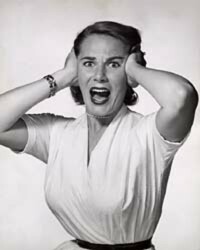 Bringing it a little closer to home right now, we look at what’s going on in the financial system, and we freak out. We look at the chaos in the world and the bells of war that are tolling, and we freak out. We look at the economy, and freak out. We look at gas prices, and freak out. It’s in our nature as humans. And honestly, it’s something we need to try to control. Because the Freak Out doesn’t help us any. It doesn’t help at all. It prevents us from thinking straight. It prevents us from making good decisions. It makes us make hasty decisions without planning. It prevents us from executing on plans and decisions we’ve already made. The Freak Out is what makes you read about a polar shift and immediately go and sell everything you own to build a new hideout somewhere you think might be safe, without thinking it through. The Freak Out is what causes people to buy a couple pallets full of Mountain House without knowing if they even LIKE eating it. So when you hear that new disaster scenario, or see headlines that make you worry, don’t be surprised if you freak out just a little. But don’t let it grow beyond that. Push down the panic, and do your best to think things through rationally. Exactly how could what you just read about affect you? Is there anything you need to add to your standing prepping plans to accomodate this? Is there anything you need to do NOW to account for the new potential? Unless the tornado sirens are going off or something along those lines, chances are that you’ve got time to think things through better, and that you’re sitting much better than you initially think. Can you feel it in the air? It feels like so many world events of late are leading to a crescendo of violence, chaos, or collapse. There are U.S. embassies being attacked around the world, with the latest tragic incident in Libya resulting in the death of the U.S. Ambassador and others. 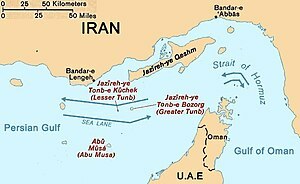 Israel seems destined to launch an attack soon on Iran while Iran threatens retaliation destruction and the closure of the Straits of Hormuz where more than one-third of the world’s oil flows through. Of course the U.S. will not allow this to happen and would be drawn immediately into the battle. Russia and China have made it clear that an attack on Iran is an attack on their interests and would act appropriately. Iran is siding up and apparently forming alliance with Syria. Japan is stirring the pot over a territorial dispute of some islands in the East China Sea. Thousands of Chinese just besieged the Japanese embassy in Beijing calling for war with Japan. Japan’s ambassador to China just mysteriously died after being found unconscious on the street near his home. An armada of US and British naval power is massing in the Persian Gulf in the belief that Israel is considering a pre-emptive strike against Iran. Warships from more than 25 countries, including the United States, Britain, France, Saudi Arabia and the UAE, launching a ‘military exercise’ in the Straits of Hormuz. Greece, Spain, Portugal, are essentially bankrupt (along with many others – it’s just not ‘official’ yet). The ECB is printing money. Bernanke’s desperate Fed is now printing ‘open-ended’ money. Countless trillions in debt without a shadow of hope for repayment. A rickety banking system and a criminal Wall Street stealing every last penny they can before it all falls down. Participation of men in the U.S. workforce today hasn’t been lower since the 1940′s. Tens of millions of ‘underemployed’ are not being counted in the official unemployment numbers. College graduates can’t find jobs and they are strapped with an unbelievable tuition debt which has never been higher in history. States and cities are going broke. The debt is piled so high it’s a wonder that it hasn’t toppled over already. Interest rates are basically zero. No interest for savings. Retired folks on fixed incomes are screwed (more-so than the rest of the middle class who already are). Prices steadily creep higher despite the coverup. Gas prices have not come down (why would they?). Food prices are certain to rise more dramatically due to the drought and the rapidly devaluing dollar. …maybe what the world needs now is World War III. Don’t laugh… it may be just what the doctor ordered, so to speak. I have collected and compiled a list of data sourced from the National Weather Service, and have put together the following PDF file, a channel list of all the NOAA weather radio stations of the United States. It cross references the location (city, state), and channel number to set on your weather radio. A weather radio should be on ‘the list’ of preparedness items to have, and can be a life saving tool, no matter what the season. They are not expensive, and provide a form of insurance for your safety. Once you set the channel to your nearest station, you can set it and forget it. It will automatically alert you if severe weather is approaching. One common issue in outlying areas is the ability to receive a strong enough signal from the transmitting station. An antenna like this one can make all the difference. NOAA Weather Radio is a service that provides continuous broadcasts of the latest weather information from local National Weather Service offices. Weather messages are repeated every 4 to 6 minutes and are routinely updated every 1 to 3 hours or more frequently in rapidly changing local weather or if a nearby hazardous environmental condition exists. Most stations operate 24 hours daily. 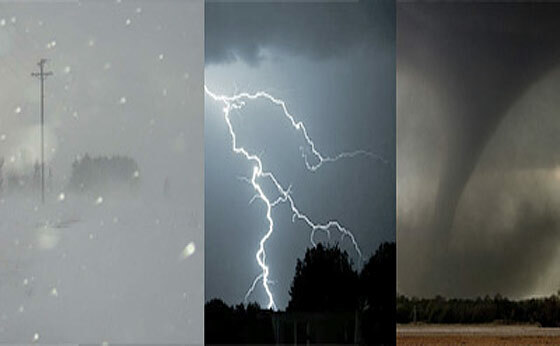 During severe weather, National Weather Service forecasters can interrupt the routine weather broadcasts and insert special warning messages concerning imminent threats to life and property. The forecaster can also add special signals to warnings that trigger ‘alerting’ features of specially equipped receivers. In the simplest case, this signal activates audible or visual alarms. In the most sophisticated alerting system, digital coding is employed to activate specific emergency conditions in a specific area, typically a county. The technology is referred to as ‘SAME’ (Specific Area Message Encoding) and is common in many weather radios today. NOAA Weather Radio currently broadcasts from 400 FM transmitters on seven frequencies in the VHF band ranging from 162.400 to 162.550 megahertz (MHz). By nature and by design, NOAA Weather Radio coverage is limited to an area within 40 miles of the transmitter. The quality of what is heard is dictated by the distance from the transmitter, local terrain, and the quality and location of the receiver. Most of us build up our food storage with store bought canned goods, home canned goods, and dehydrated fruits and vegetables. And that is an excellent approach. It would be hard to eat a steady diet of bulk goods like corn, wheat, beans and rice without added flavors and textures. In fact, cooking with just staples can lead to what’s known as “appetite fatigue”, a situation where that same bland meal, eaten day after day, may lead people to choose to go hungry—especially the very young and the elderly. I’ll address appetite fatigue in my next post, but for now, I want to share some good news for those of you who have worried about the relatively short shelf life of canned goods. For years, we have been told the average store bought can of food has a shelf life of two years, give or take. If you’re storing foods that you eat, the goal becomes to rotate through the food at a pace that allows you to eat it all before it goes bad. When we’re busy with hectic every-day lives, it is sometimes difficult to use a first-in-first-out (FIFO) food rotation method. For others, a rotation method, where you consume and replace canned goods before their expiration dates is flat-out impossible. I could be the poster child for this situation, so I’ll use myself as an example. I have stored food for twenty-three people. These family members do not live at my homestead. How, then, can one person rotate food meant for twenty-three? And what about those who have a bug-out cabin and are only able to visit their property occasionally? Up until now, most folks invested in relatively pricy dehydrated/freeze dried fruits and vegetables along with bulk goods because it seemed like the only answer. And don’t get me wrong; I believe dehydrated and freeze dried foods are great for food storage…as long as you can afford it. We have all heard stories about someone bravely “testing” an old can of food or preserves decades after its advisable date and lived to tell about it. But for most, these stories were viewed more as an urban legend than a reality. Dale Blumenthal with the Food and Drug Administration wrote an article a few years back that I only just discovered which had interesting facts on a study that was performed in 1974 by the National Food Processors Association. This study was done on 100 year old canned food that was found on the Steamboat Bertrand. It needs to be pointed out the Bertrand had swamped under its heavy load and sank in the Missouri River in 1865. It was later recovered in 30 feet of silt. The canned goods that were tested from this recovery consisted of oysters, brandied peaches, plum tomatoes, honey and mixed vegetables. The contents of these 100 year old cans were tested for bacteria and also for their nutrient value. When tested, it was noted that the food had lost its fresh appearance and fresh smell, but it did not contain microbial growth, and was just as safe to eat 100 years later as it was when it was canned. Vitamins C and A were lost, but the foods still had high levels of protein and they contained all of its calcium and was deemed comparable to todays canned food. As preppers, we are aware of how important it is to put food safety at the top of our priority list, especially when we can’t expect to get medical attention in the midst of catastrophe. On the other hand, I have long suspected the two-year sell-by date given by the food industry at the FDA’s insistence had given us a false sense of fear that is in direct conflict with our forefather’s wisdom. I can tell you I’ve personally been the test-crash dummy for many an outdated can of food. While growing up on an Alaskan homestead, far from the grocer who sold canned goods at double the going rate, my sister, brothers and I were routinely subjected to testing this theory of consuming outdated canned goods and never once suffered ill consequences. Although I will summarize this incredible report written by Dale Blumenthal, I highly recommend that you go to the following link and see for yourself. It is important when cooking with ANY food storage to know, without a doubt, it is safe to consume. Included in Dale Blumenthal’s paper, the National Food Processors Association chemists didn’t stop with testing the canned food found on the ship-wrecked Bertrand. They also analyzed a forty year old can of corn from a California basement where it had been stored all those years ago. No contaminants were found, and the nutrient loss was not significant. In another study, the U.S. Army stated that 46 year old canned meats, vegetables and jam were likewise tested and found safe to eat. When storing long-term canned goods, check each can for dents before storing. Any dented cans should go in the kitchen pantry for immediate use, rather than taking chances with long-term food storage. Before consuming canned goods, always check for these warning signs: cans with bulging tops or bottoms MUST be tossed out. It is an indication that it contains dangerous bacterial growth. A leaking seal found in canned goods should also be tossed out, as this is another indicator that the can may contain harmful bacteria. There is a new wave of consumers that’s worth mentioning. NPR reporter Serri Graslie wrote an article titled Willing To Play The Dating Game With Your Food? Try A Grocery Auction. The article describes that some consumers are purchasing food that has reached, or neared, its sell-by date. Surprisingly, there are no laws on the books with regards to selling food that has reached its shelf life and entrepreneurs have caught on to the need for affordable food and are now selling it at food auctions to the public for much less. Even if you don’t intend to store food that has neared its sell-by date, it may be worthwhile to investigate it for the kitchen pantry, leaving those saved dollars for long-term food storage. “Every year, U.S. grocers discard $10 billion to $15 billion in unsold products. The items might be damaged, discontinued, seasonal or food that’s just close to its sell-by date. Although this may be a new trend in lowering the ever-increasing cost of food, should you venture there, it is wise to inspect the cans. Over the years, I’ve heard those who swear by buying damaged or dented cans to cut costs. This is not a good practice as it is possible dented cans may have resulted in a damaged the seal that can lead to illness. The FDA insists foods are given a sell-by date for consumer safety. Over time, most manufacturers have arbitrarily given most canned goods a shelf life of 2 years. It is NOT the safety of the foods they are referring to with their sell-by dates , but more of an industry standard and also denotes the time span of canned foods optimal nutrient value. In an emergency situation, although it is best to consume canned goods at their freshest state possible, an item that has passed its given Sell-by date still offers life-sustaining sustenance. **David’s Note: Our family eats what we store, but we primarily choose to eat fresh local produce for the majority of our meals instead of eating from our food storage. The natural result of this is that a lot of our food storage expires on a regular basis. What we have chosen to do is to support our church’s food bank with food that is not expired, but is within a few months of expiring. They use the food immediately, well before it “expires”, and we replace it with new food. It’s not really a big deal for us…instead of giving our church money that they’d use to go out and buy food, we just save them the step and give them food. Interestingly/sadly, the food that we donate usually tends to be a LOT healthier than the other food in the food bank. Do you fear canned goods that have passed their prime, or are you already convinced an expired sell-by date is safe to consume? Share your thoughts by commenting below. You’ll notice that we completely removed the “Facebook commenting” from the site. I’m not a big fan of it, and judging by your responses, you aren’t either and would rather have the simple commenting that we had before. Changing directions somewhat, if you haven’t taken advantage of the Target Focus Training Survival package yet this week, I STRONGLY encourage you to check it out by going here and taking action now. Making a bracelet from paracord (also called parachute cord) is a relatively easy project. We did this together as a family and even my 8 year old got one made with not too much help from mom. 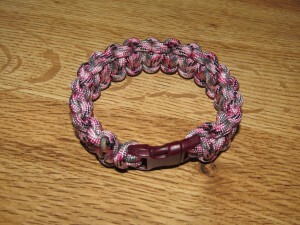 A paracord bracelet gives you approximately 8-10 feet of usable cord that you can wear wherever you go. 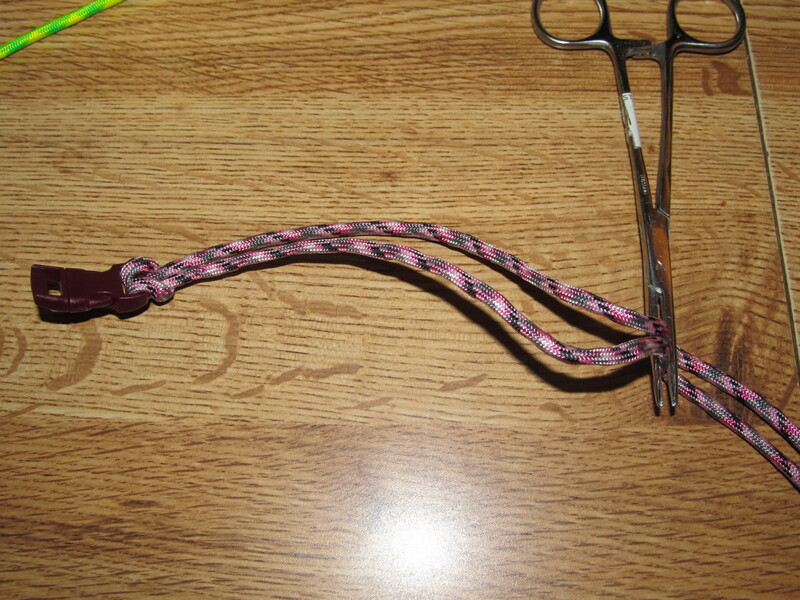 You could also make it longer and use it for a dog or cat collar. 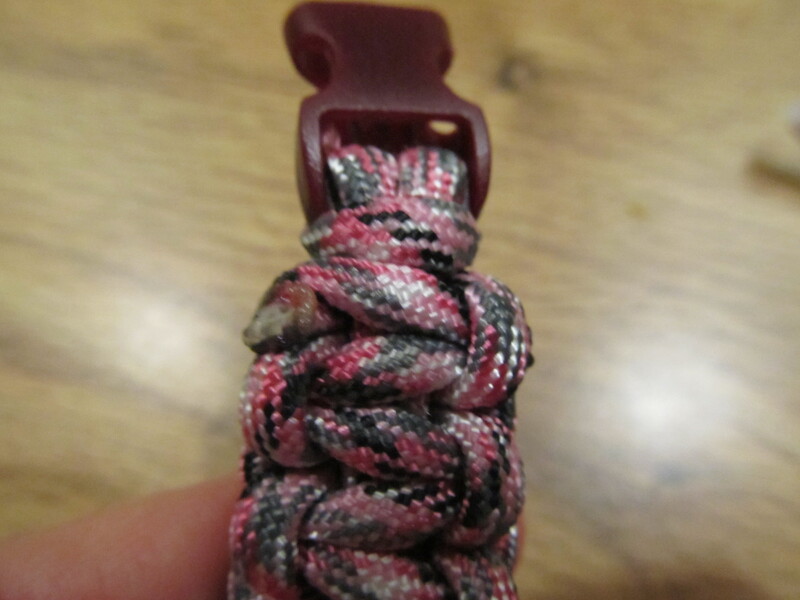 Although there are varieties made with just paracord and no buckles, we made ours with side release buckles to make it a little easier to get on and off and more secure once it was fastened on. 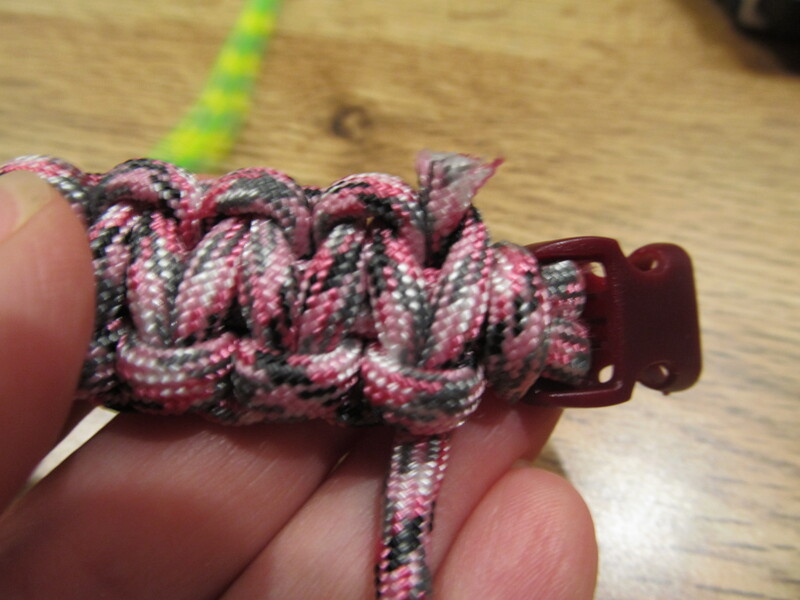 About 10 feet of 550 Paracord. I got mine at the Army Surplus store, but you can find it online at places like CampingSurvival and The Supply Captain. 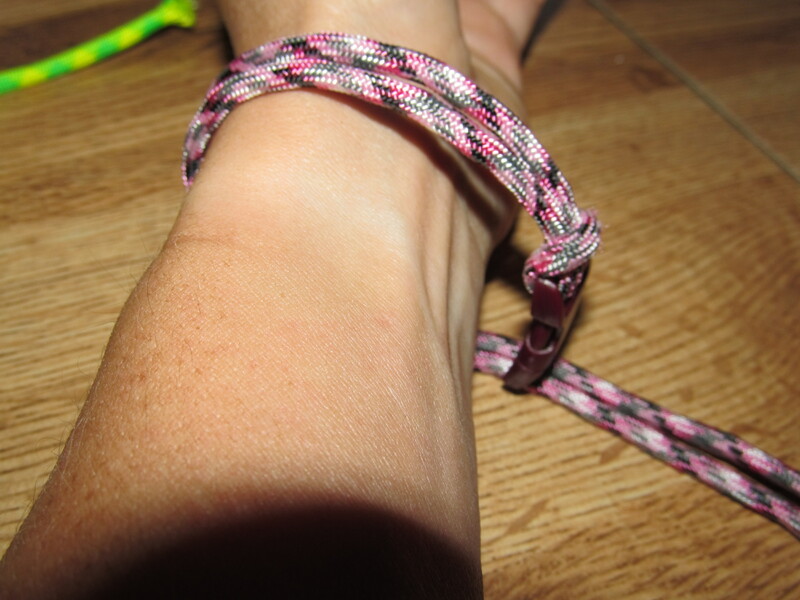 The bracelet needs about a foot for every inch, but varies quite a bit depending on how tight you tie and how many knots you squish into an inch. Side Release Buckle. These are also available online. Mine are 3/8″ size, but you men might want a little larger size–these are a bit tedious to manipulate with hands larger than a lady’s. 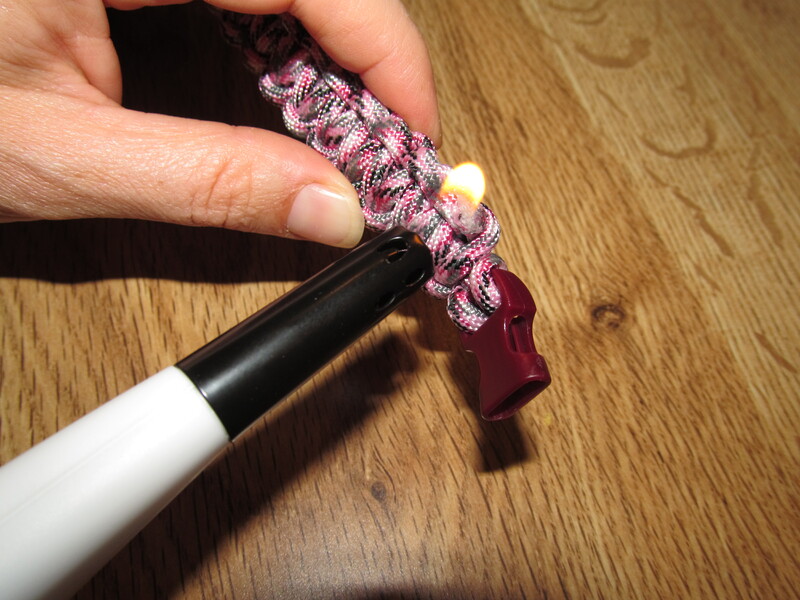 Flame source like a lighter for melting the ends of your paracord. 1. Find the middle of your length of paracord by folding it in half. Stick the folded middle loop through one side of your buckle. This is my OCD showing, but it looks nicer if you put your loop in the top of the buckle hole rather than up from the bottom. If your buckle is small, you may need forceps to pull the folded cord through the slot. 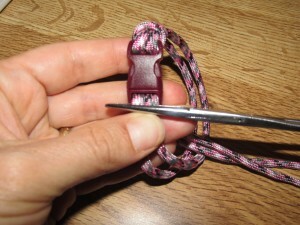 Once you have your loop through the hole, thread the rest of the cord through the loop to fasten it to the buckle. 2. 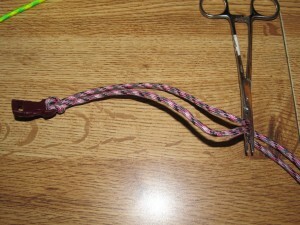 Loop the cord around your wrist with the buckle attached. 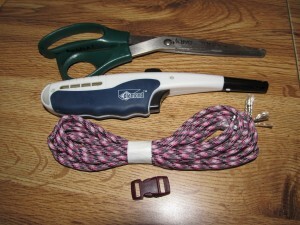 You could alternately measure around your wrist and then measure the cord. 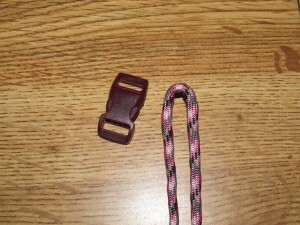 Either way, you want to know where to attach the second half of the buckle to the cord. 3. Thread the loose ends of the paracord through the second half of the buckle to the marked point. Again, going down from the top looks better than coming up from the bottom. 4. If you have your buckle fastened, open it up. Now we’re going to start the knots. 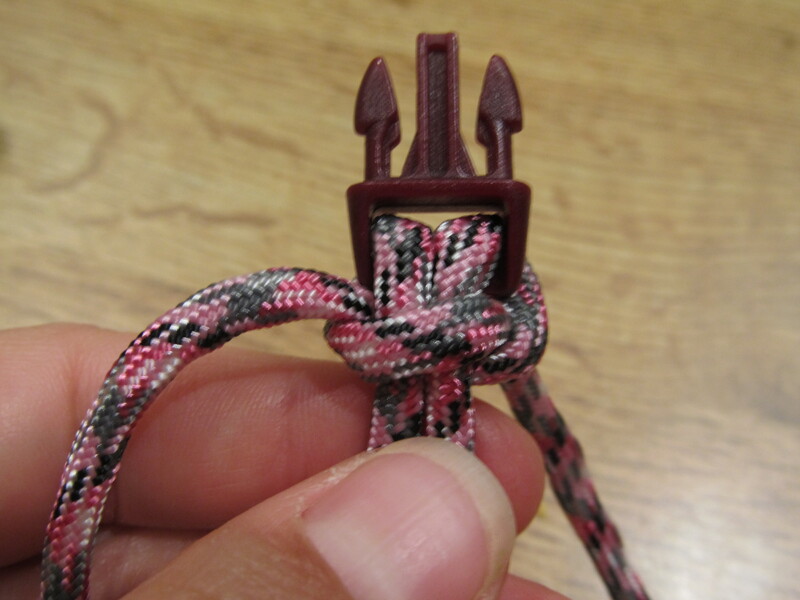 The knot we are tying is called the cobra knot or Solomon bar. 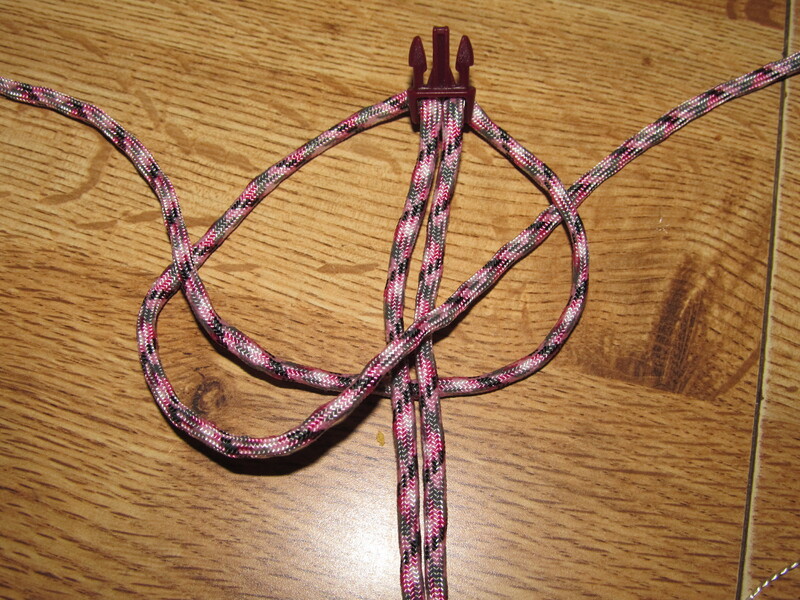 It’s basically an overhand knot like you’re tying your shoes, but you just have to make sure the center core cords are tucked in the middle right. 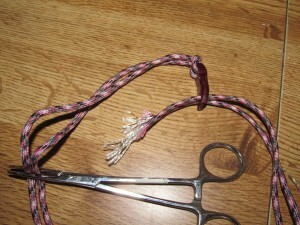 To start, take your right cord and cross it under the core cords and over the left cord, leaving a little slack on the right side. 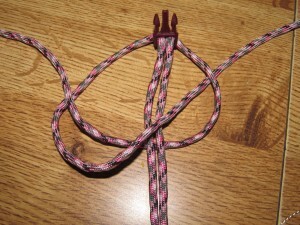 With your left cord, go over the core cords and down through the slack loop (under the right cord). Now pull it tight. 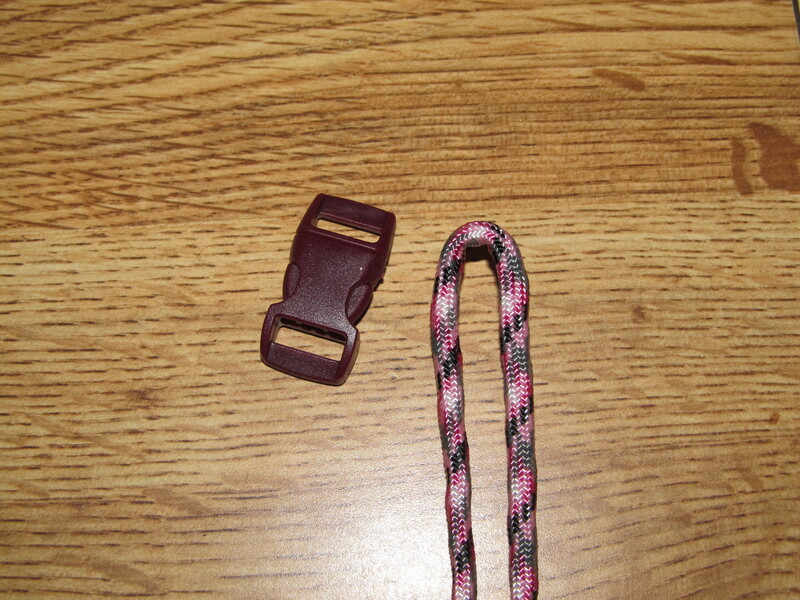 At this point, with both ends of your buckle secured, you want to try your bracelet on again and make sure you like the fit. 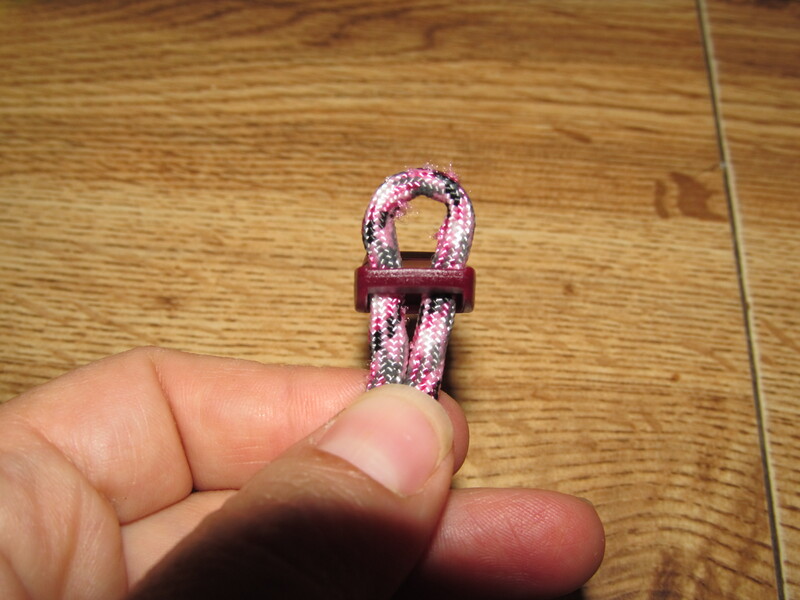 Contrary to what your brain tells you, the bulk of tying all those knots onto the core cords actually doesn’t decrease the diameter much if any, so when it’s done it will fit very close to how it fits at this point. 5. Repeat the knot for the length of the core cords, alternating which side you start on each time. 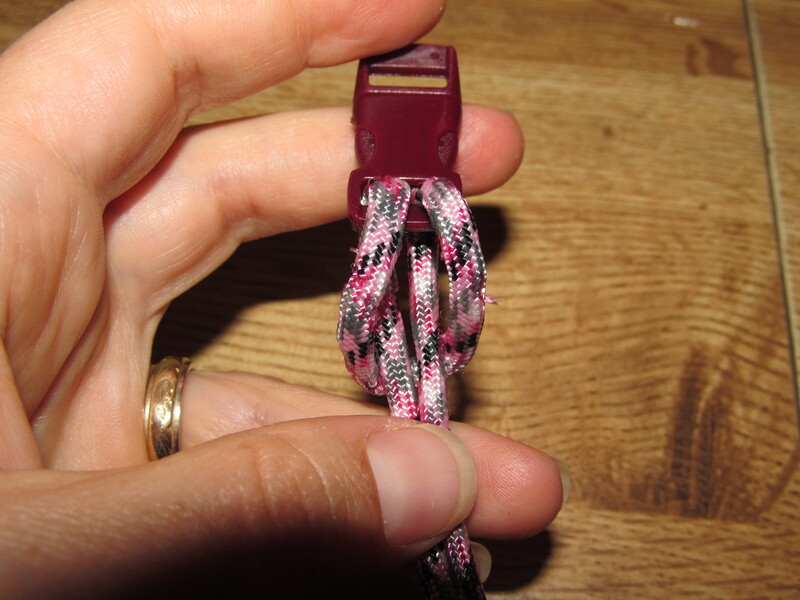 If you look at the cords when you’re done with a knot, one of them is coming out toward you and one is threaded down away from you. 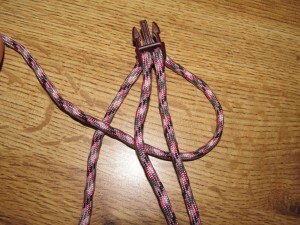 The cord coming toward you is the one you want to go under the core and over the other one. The cord threaded away from you goes over the core then through the hole. 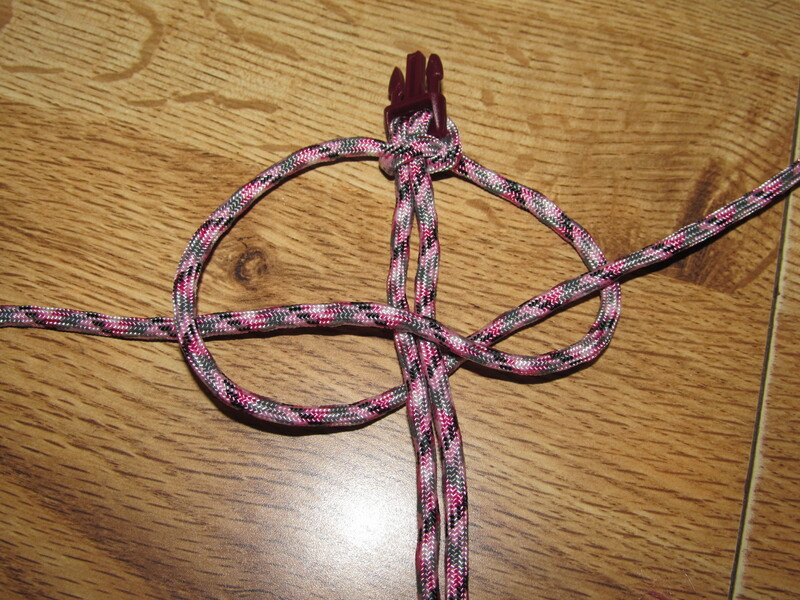 If you get this backward, it will start twisting and looking funny, but you can always untie it and do it again. We found ourselves repeating: Cord 1=”under, over”, Cord 2=”over, through”. Under over over through, under over over through, under over over through. It’s kind of catchy. 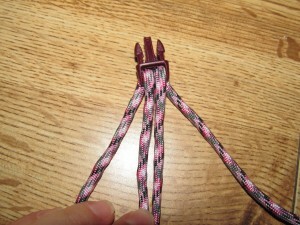 Tying them all the same tension makes nice, even edges on your bracelet. 6. When you get knots tied all the way to the first buckle, cut the ends fairly close and melt them so they don’t come unraveled or untied. I cut one at a time and melted it using a knife or the scissor edge to flatten it and smash it into the bracelet. That’s it. You’re done. 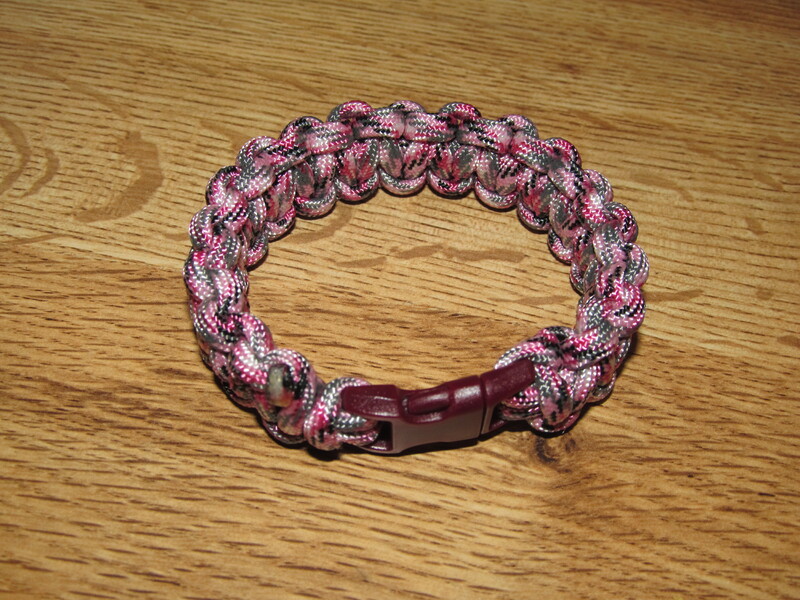 You now have a fashionable and useful bracelet made from paracord! These would make fun gifts for the extended family–even the kids can make these. 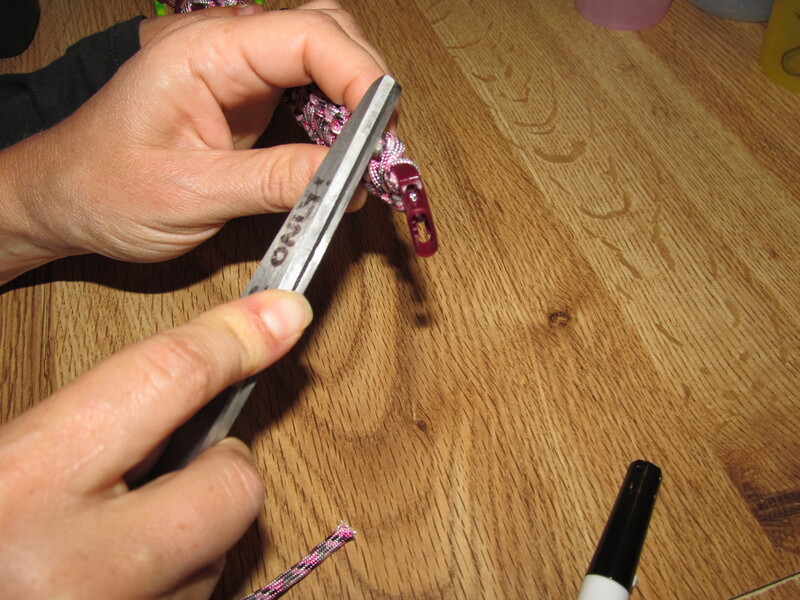 I bought my parts piecemeal–no bulk purchases–and our cost per bracelet was under $2.00. 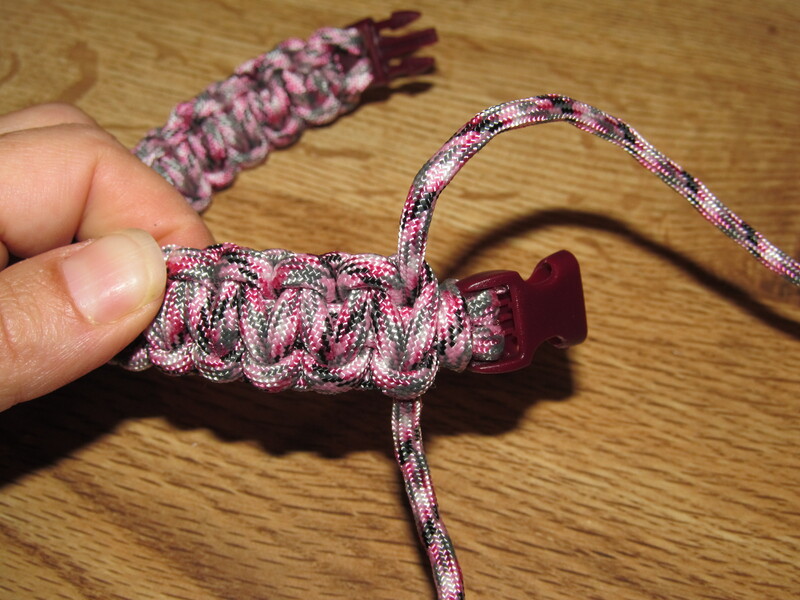 The cost gets even lower when you purchase paracord and buckles in bulk. 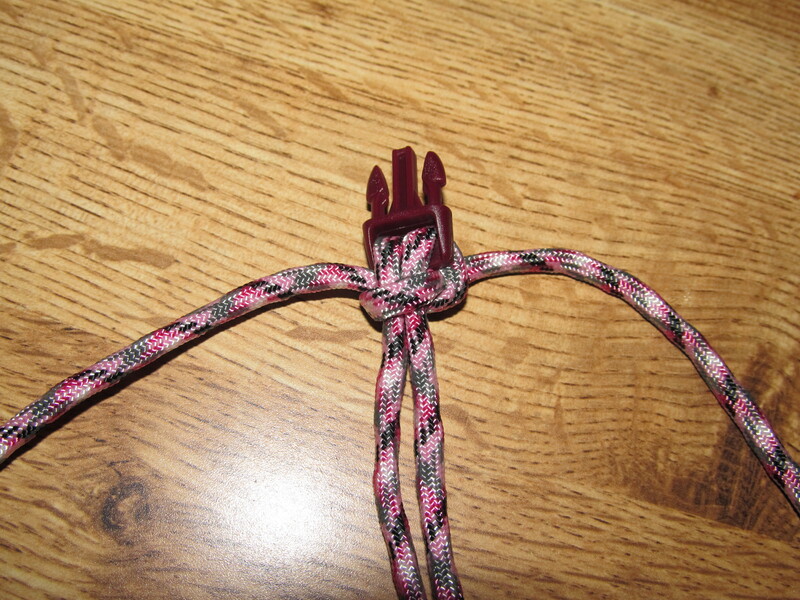 Time for a beginner to make this was 30-45 minutes depending on how quickly they figured out the knots and how many they had to untie and re-tie. 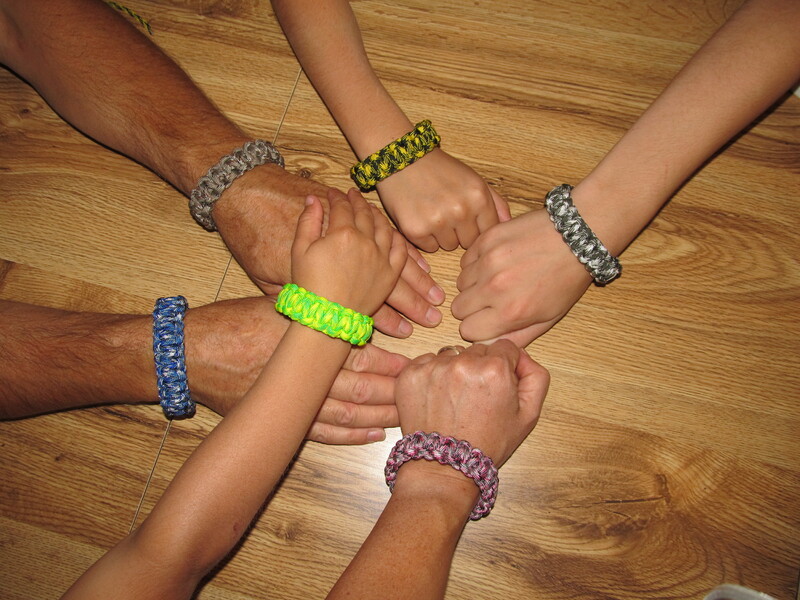 We had a lot of fun making these together, so definitely involve the family on this project! Enjoy! Got a headache? Here, have some Tylenol! Did you pull a muscle exercising? Motrin might help! Pain happens, and there’s a pill for nearly every pain. But what happens if the pharmacies are closed? There are other options besides popping a pill – give these methods a try! A535 or Sports Rubs: These analgesic gels can help relieve aches and pains from overused muscles, back spasms or arthritis. These rubs contain camphor, eucalyptus oil, menthol, and methyl salicylate and heat up on contact with the skin. If you are allergic to aspirin or if you have coagulation issues, you should not use these rubs. Arnica Gel: A natural version of the sports rub, Arnica Gel works to relieve pain in sore muscles or bruises. Hot Water Bottle: The very low-tech hot water bottle aids in relieving pain from sore muscles, stiff necks and menstrual cramps. A water bottle applied to the back of the head or neck can help relieve a headache. Massage: Massage can relieve muscle pain. If you don’t have a willing pair of strong hands around, you can use a tennis ball to help loosen up tight muscles. Massaging the temples gently can alleviate a headache. Lay completely flat on the floor. Pull one knee up to your chest, keeping your other leg straight and flat on the floor. Hold the knee to your chest by wrapping your arms around it. 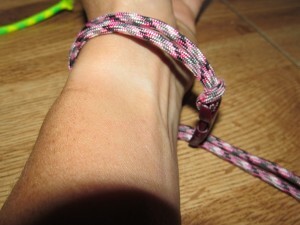 If you are able, hold the stretch for 30 seconds to one minute. Gently release your leg and do the same thing with the other side. Get on all fours on the floor. This stretch is called an “angry cat” and that is exactly the position you want to achieve. Never drop your spine down towards the floor, as this will hyperextend your backbone. Curve your spine upward and form a downward “C”. Hold this while concentrating on sucking your belly button in towards your spine. Release and repeat. From your all fours position, place your hands flat on the floor. Then push yourself up with your weight balanced evenly on your hands and feet. You should be in the shape of an inverted “V”. This is called “downward dog”. You will feel a bit of tension in your lower back, but no pain – pain means stop! Hold this for 30 seconds to one minute, then walk your feet up towards your hands and stand up. Ice Pack: In an off grid situation, this may be unavailable. However, there are packs that can be stored that get cold through a chemical reaction when opened. As well, in the winter, an ice pack is as close as your back door! Apply ice packs to bruises, sprains and swelling, as the cold has anti-inflammatory properties. Hot Bath: A hot bath can relieve aches and pains of all types including headaches, sore muscles, and joint pain. Herbal Teas: Many herbal teas have muscle-relaxing and antispasmodic properties: lemon balm, peppermint and chamomile are among the most common. Coffee: A heavy dose of caffeine can aid in getting rid of a stubborn headache, including migraines. Exercise: A brisk walk releases feel-good endorphins. This chemical can help reduce pain as well as improving your mood. This is a great natural way to get rid of a headache. Don’t wait until disaster strikes to reduce your use of pharmaceutical painkillers – start now by taking the natural route whenever possible. By doing this, when you do need to dole out the pills, your body will be more receptive to the medicinal effects, allowing you to take less and have a faster and more thorough effect. A month or so ago, I happened to mention that I had purchased some antibiotics to stockpile for long term survival purposes. It’s not, you know, that I believe in popping antibiotics every time I get a sniffle. Nothing could be further from the truth. But a recent situation where I had a very bad tooth abscess that had to go untreated for almost a week convinced me that antibiotics for use in a collapse situation were an important part of my preps. Let me say this: I am not a health care professional nor am I especially qualified on all things health related. On the other hand, I do believe in medical self-care and I do believe in doing my own research. It was during that research that I learned that fish antibiotics are the exact same formula as human antibiotics. WTF? This was not casual research. I went to many sources, looked at bottles, and asked a lot of questions. I came away confident that lacking proper medical facilities, the judicious use of fish and veterinary antibiotics would be safe in a SHTF situation. And the best part about it? They are readily available online at reasonable prices without a prescription. But as I said, I am not a health care professional and am hesitant to offer even a modicum of advice on this subject. So what I did is contact my friend Dr. Joe Alton better known as Doctor Bones who, along with Nurse Amy, host the Dr. Bones and Nurse Amy Doom and Bloom Nation. As an MD and ARNP, Joe and Amy have written The Doom and Bloom Survival Medicine Handbook and are uniquely qualified to provide guidance on the matter of using fish antibiotics in a disaster or collapse situation. All of the above, with the exception of Amoxicillin and Ampicillin, are acceptable to those with Penicillin allergies. And furthermore, with the above antibiotics, you should be able to to treat 90% of the bacterial diseases that will appear on your doorstep in times of crisis. With this introduction, I want to let you know that Doctor Bones and Nurse Amy have graciously and generously given me permission to share their four part series on Antibiotics and their Use in Collapse Medicine. Why is this important? Because a list of antibiotics is only a list. Which drug do you use for what? For how long? And how much? These are extremely important questions that will need to be answered before taking any antibiotics. Today I present part 1 of the series on Antibiotics and Their Use in Collapse Medicine(tm), along with some links to sources for the items mentioned above. And as always, if you have a medical condition, the advice and counsel of your own physician come first. One of the most common questions that I am asked from prospective survival medics is “What antibiotics should I stockpile and how do I use them?” There isn’t a 60 second answer to this. Actually, there isn’t a 60 MINUTE answer to this, but anyone that is interested in preserving the health of their loved ones in a collapse will have to learn what antibiotics will work in a particular situation. · Overuse can foster the spread of resistant bacteria. Antibiotics routinely given to turkeys recently caused a resistant strain of Salmonella that put over 100 people in the hospital. 36 million birds were destroyed. · Potential allergic reactions may occur that could lead to anaphylactic shock (see my recent article on this topic). · Making a diagnosis may be more difficult if you give antibiotics before you’re sure what medical problem you’re actually dealing with. The antibiotics might temporarily “mask” a symptom, which could cost you valuable time in determining the correct treatment. You can see that judicious use of antibiotics, under your close supervision, is necessary to fully utilize their benefits. Discourage your group members from using these drugs without first consulting you. There are various others that you can choose, but the selections above will give you the opportunity to treat many illnesses and have enough variety so that even those with Penicillin allergies with have options. Cephalexin, although not in the same drug family, has been quoted as having a 10% cross-reactivity rate with Penicillin. This is a lot of information, but how do you approach determining what dose and frequency would be appropriate for what individual? Let’s take an example: Otitis Media is a common ear infection, especially in children. 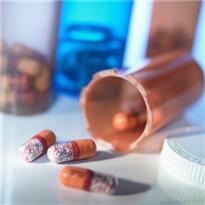 Amoxicillin is often the “drug of choice” for this condition. First, you would want to determine that your patient is not allergic to Amoxicillin. The most common form of allergy would appear as a rash, but diarrhea, itchiness, and even respiratory difficulty could also manifest. If your patient is allergic, another antibiotic such as Sulfamethoxazole/Trimethoprin or Cephalexin could be a “second-line” solution. Once you have identified Amoxicillin as your choice to treat your patient’s ear infection, you will want to determine the dosage. As Otitis Media often occurs in children, you might have to break a tablet in half or open the capsule to separate out a portion that would be appropriate. For Amoxicillin, you would give 20-50mg per kilogram of body weight (20-30mg/kg for infants less than four months old). This would be useful if you have to give the drug to a toddler less than 30 pounds. A common child’s dosage would be 250mg and a common maximum dosage for adults would be 500 mg. Take this orally 3 times a day for 10 to 14 days (twice a day for infants). Luckily, these dosages are exactly how the commercially-made medications come. If your child is too small to swallow a pill whole, you could make a mixture with water (called a “suspension”). To make a liquid, crush a tablet or empty a capsule into a small glass of water and drink it; then, fill the glass again and drink that (particles may adhere to the walls of the glass). You can add some flavoring to make it more palatable. Do not chew or make a liquid out of time-released capsules of any medication, you will wind up losing some of the gradual release effect and perhaps get too much into your system at once. These medications should be plainly marked “Time-Released”. Anytime you, as medic, place a person on a new medication or supplement, they should be carefully watched for signs of allergy. If they develop a rash, itching, diarrhea, or other untoward symptoms, you should discontinue your treatment and look for other options. You will be probably see improvement within 3 days, but don’t be tempted to stop the antibiotic therapy until you’re done with the entire 10-14 days. Sometimes, you’ll kill most of the bacteria but some colonies may persist and multiply if you prematurely end the treatment. In a collapse, however, you might be down to your last few pills and have to make some tough decisions. For official recommendations regarding the use of Amoxicillin to treat the other illnesses listed, consider investing in a book called the Physicians’ Desk Reference. It will have all this information (and more) on just about any medication manufactured today. 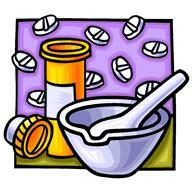 Listed are indications, dosages, side effects, risks, and even how the drug works in the body. Online sources such as drugs.com or rxlist.com are also useful, but you are going to want a hard copy for your library. You never know when we might not have a functioning internet. The ultimate decision as to whether or not you should treat yourself or a loved one with antibiotics is a personal one. For sure you need to be aware of any and all allergies because in a disaster or other crisis, there may be no one to call if things go awry. In my own case, I would not take a drug that I had not taken before and without incident so luckily, over the years I have kept a list of antibiotics that have been troublesome. At the end of the day, medical self-care may be all you have. Learn as much as you can now and gather your resources – in printed form – in advance. If you have not so already, this would be a good time for starting to compile a listing of medications that have been bothersome if not downright dangerous to you and your family members. Over the next month of so, I will be posting the rest of the series on Antibiotics and Their Use in Collapse Medicine. In the meantime, I highly recommend Doom and Bloom Survival Medicine Handbook and also the useful and medically credible information that you will find at the Doom and Bloom website. How much Cash Should I have? Survival Kit Gear Test - Will It Float?